For some acidity I added a fresh tomato, but canned tomatoes would also work fine. I like my curries spicy, so I added a generous amount of chili powder, but omit if you’re not into spicy foods. 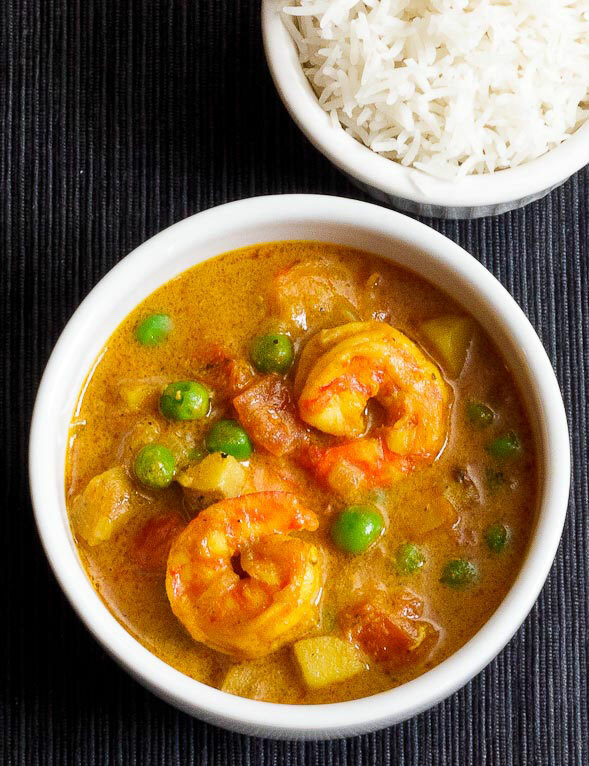 Serve this curry with steamed basmati or brown rice. 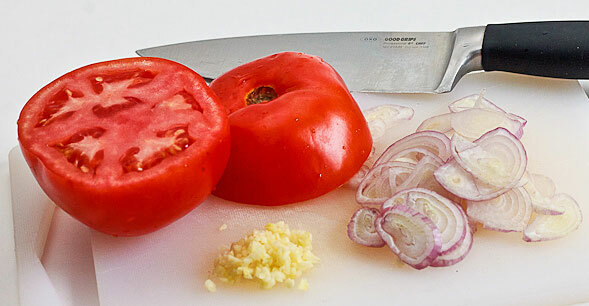 Prep and chop your vegetables. Heat oil in a pan and add curry. 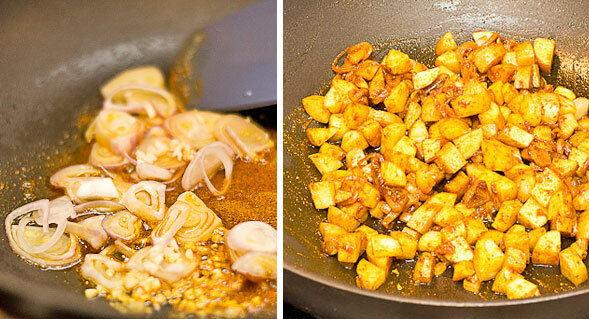 Saute garlic and shallot, then add potato cubes. 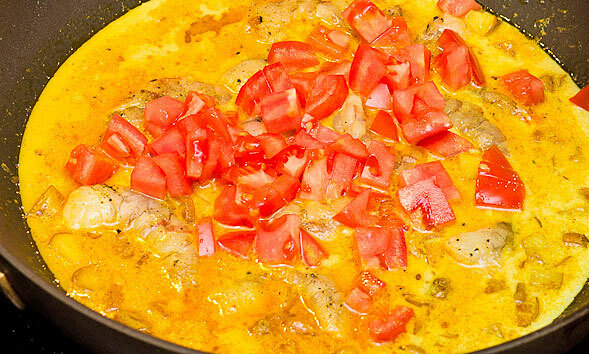 Add the coconut milk, milk, shrimp and tomatoes, then cover with a lid and simmer. Thanks Heidi! 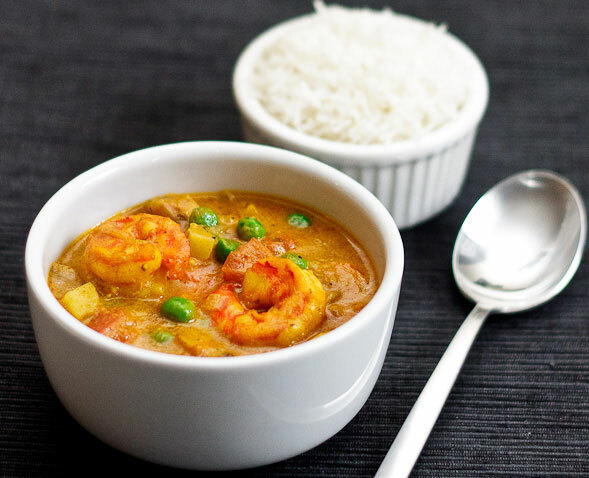 Curries are my favorite, especially with coconut milk. This looks delicious. 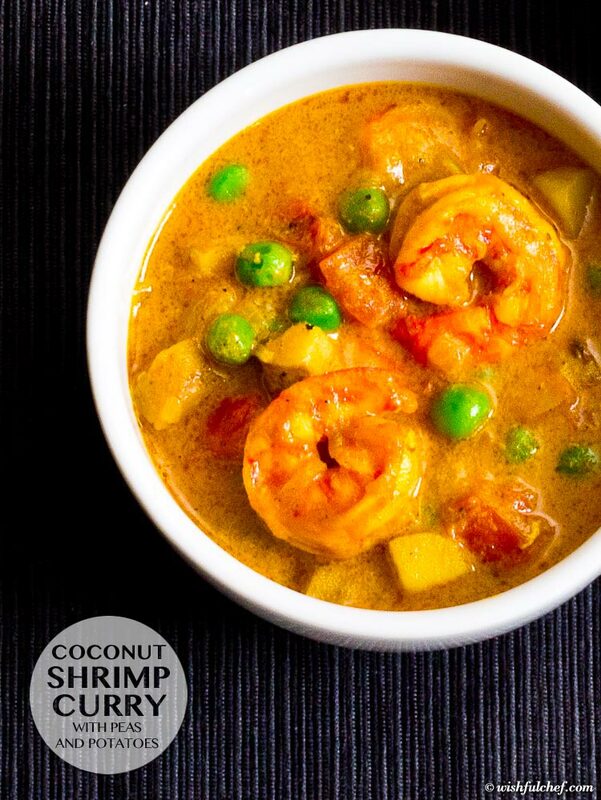 I love curries made with coconut milk – can’t wait to try this! Made this last night – it was absolutely delicious! Great recipe! I cooked this for dinner tonight. I made some substitutions though, like half-bag of seafood medley for shrimp, real chili for chili powder. DH loved it! This curry recipe is a keeper. @Bea – Same here, leftover curry is so tasty! It’s a great dish to prepare ahead of time. 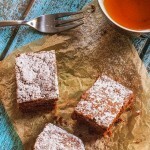 Found this recipe off Tastespotting on my iphone as I was walking through the supermarket! It looked so good and simple, I made it tonight…and…it was delicious! Thank you! I made this last night and LOVED it! I left out the chili b/c my family can’t handle the heat but it was still awesome. Thank you. Thanks, Stephanie! It’s such an easy dish to make, it’s one of our favorites. 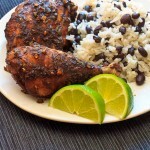 Hi, I found your blog through Tastespotting the other day when I saw this recipe. I made it tonight with a couple of changes. It was very tasty and I am looking forward to leftovers! Besides doubling the recipe, I left out the tomato but put in a bit more tomato paste instead. In addition to the doubled coconut milk, I only used 1 1/2 times the amount of regular milk, which still seemed a bit soupy for me, but we had plenty of rice to sop it up. Instead of curry and chili powders, I used a tablespoon of Thai red chili paste. I will definitely make it again! 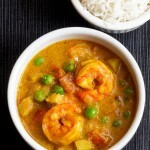 Shrimp and curry, can’t go wrong! 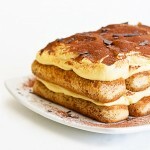 I found your blog through tastespotting, too! If you like curries, I have to direct you to World Spice Merchants. They’re a little shop in my town with the most incredible spice selection. They even grind everything to order- no pre-packaging! There’s got to be almost twenty varieties of curry. I think the Capetown Masala is the spiciest one I’ve tried, and it is SO GOOD. (http://www.worldspice.com/blends/curry-capetown-masala) I’ve turned all of my cross-country family on to their mail ordering. Thanks for the recipe! It has ‘Sunday night’ written all over it. Thanks for the comment Lena. Looks like a great store for spices, will definitely check it out. I typically grind my curry blends at home but it’s good to have some pre-made at home as well. has anyone ever tried this with chicken? would you need to cook the chcicken first or let it simmer in the pot? thanks! Hi Stephanie – Yes, it works great with chicken. I’d add the chicken right after sauteeing the onions/garlic and brown it for a few minutes before adding the rest of the ingredients. Made Curried Chicken using this recipe as a base tonight. It turned out terrifically! I substituted red curry paste for the curry powder and half a small onion for the shallot–added the chicken to the bubbling liquid of the coconut milk and everything else and let it simmer away for 10 or 15 minutes until the chicken was cooked through and tender. It was really delicious! That’s great to hear Catherine, thanks for commenting. Love the red curry paste idea, I’m sure your dish had a nice kick to it? Yes, it was nice and spicy, which I like. I haven’t been able to find a curry powder that’s strong enough to give that curry flavor. I know I need to use ginger, garam masala, garlic–not sure what else. The curry paste does the trick nicely. Thank you so much for posting this comment. I was about to ask about substituting red curry paste for the powder since I could not find it at my store. Was it a 1 to 1 ratio or did you use more paste? I made it with 1 Tablespoon of Thai red curry paste. A bit of a bite, but not too fiery. I made this today. Made some changes. I added corn, paprika, turmaric and a bay leaf . We don’t like it spicy, so I didn’t use chili. It came out great. Thanks for the recipe! I think this would work with chicken or fish too. 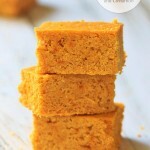 Wondering about making this with all coconut milk instead of 1/2 coconut 1/2 regular milk. Have an allergy to milk so might give that a try. Has anyone tried making it dairy-free? Totally, I haven’t made it this way but I’m sure it’ll be delicious. If the sauce gets too thick, you can add a little water towards the end. 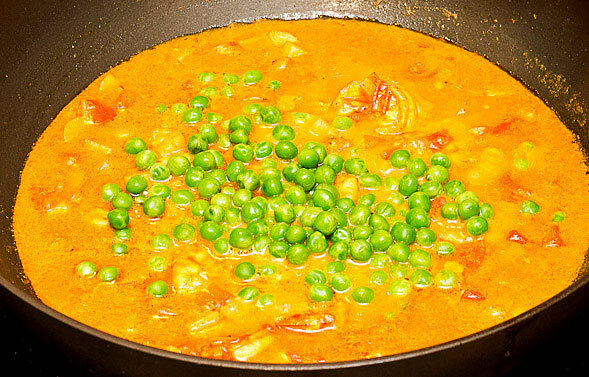 This is such a tasty and easy curry to make! I did it all up in the morning, went to work came home and just put it right back on the stove, added the pees at this point and cooked some rice. It was so yummy and fed a lot of us. The potatoes make it nice and filling too! Easy, weekday meal. I like a spicy curry, so I needed to add some cayenne to pump up the flavor. I used light coconut milk and nonfat milk, which worked great. Yes, it’s the perfect meal to make on a weekday and so versatile. Thanks for the comment, Nicole! Wow, does this every look good and so comforting. I used to HATE curry, until I discovered red curry. I’m assuming you’re using a yellow curry? 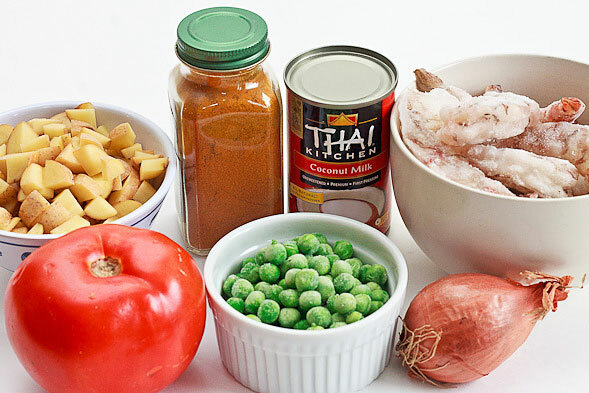 Not sure, but I’m going to try this with red curry. looking forward to this. Hi! Do u add the shrimp when frozen? 🙂 thx! Hello! I would thaw the shrimp a bit before adding. Let me know if you make the curry. Made this tonight! Forget to buy tomatoe paste so I used ketchup. Still came out delicious! Thanks for sharing this. 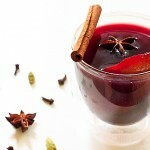 I will be adding this recepie to my favorites! Plus I added lemongrass! Very good! I wish I had held to the shrimp longer before cooking with the rest of the ingredients. I notice potatoes take longer to cook. A note to self for next time. Other than that, I added lemongrass, doubled the tomato paste and added a bit of water and dried mushrooms. Delicious! Very hearty. Just what I needed for this cold that won’t go away. Thank you. I did use your suggestion for the addition of potatoes and would emphasize they need to be a small, even dice in order to cook in the sauce in 30 minutes. I might actually parboil them in salted water first next time. Also, since shrimp cook much faster than potatoes, I held back on the shrimp and put them in with the peas (shrimp would be hard rubber after thirty minutes of cooking). I added 2 tsp of Red Thai Chili Paste 1-2 TBSP of fish sauce to season and compliment the seafood flavor. It really needed a little extra kick, but that may be related to the Singapore curry powder I used, which is pretty mild. This was an amazing dish. I added about half a tablespoon of chili paste to add a spice that tickled the back of your throat and it really rounded everything out for those who enjoy a tingly spice. Thank you for this post. I will definitely be making this again. Thanks so much for your nice comment, Jake! I’ll have to try adding some chili paste to mine next time. 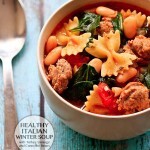 I am making this tonight for dinner.. So excited!!!! I bought all my ingredients last night. Now if only the baby would nap in his crib instead of on me so I can start it… 🙂 thanks for this! I’m excited for you too!! I hope he naps in his crib soon so you can start 😉 Thanks for your comment, Monica. Let me know now it turns out! Wow, I feel so honored that I’m the first blog you ever commented on 😀 I’m really happy the recipe turned out well with the vanilla almond milk. I tried this with almond milk before but not with the vanilla so I’m glad it tasted just as good. Thank you so much for the kind words and I hope to see you again on here soon. Take care! Looks delicious and would like to have this for dinner tonight. Is it ok to use garam masala instead of curry powder? Thanks so much! I like to cook with garam masala but have never tried it with this recipe. It’ll definitely give it a much different flavor but why not give it a shot? Let me know how it turns out. 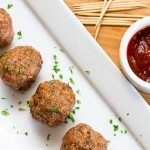 What an easy and delicious recipe! I did not have tomatoes so I doubled the tomato paste, used precooked shrimp (all I had on hand.) I misread the coconut milk amount and used my whole can that was 400mL but I think that is why I ended up liking the recipe in the end (I am not a big curry lover.) I will make this again and probably make a vegetarian recipe for myself! I’m really glad you enjoyed this even though you’re not a curry lover 🙂 I bet it turned out pretty creamy since you used more coconut milk but it sounds great, Kacey! I’m so happy your family loves this recipe! Thank you so much, Ann! Loved this totally. Simple, quick and delicious. Thanks for the recipe.